Why Is the Public Suddenly Down on Unions? Additional references for this memo are contained in the PDF. Americans have expressed generally positive attitudes toward unions for as long as pollsters have been asking, and for decades public approval of labor unions has hovered around 60 percent. 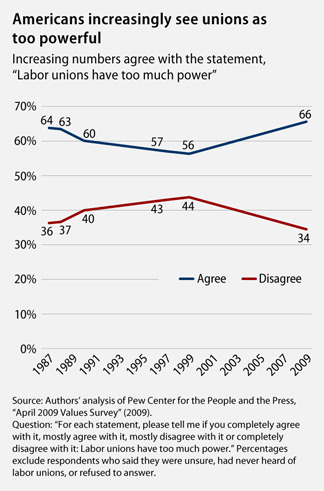 But starting in 2009 public opinion toward labor unions dropped precipitously. Why? Last summer less than half of Americans said they approved of labor unions. This is the first time this happened in the over 70 years the Gallup survey research group has asked. Just one year earlier nearly 60 percent of respondents approved of labor unions. Similarly, a 2010 Pew Center for the People and the Press survey found union favorability was at just 41 percent, while in 2007—the last time they asked the question—favorability was 58 percent. The Pew survey also found that the decline in support was widespread, falling for virtually every demographic and political group. What happened? And what does this mean for the U.S. labor movement’s future given that membership is already at 30-year lows? The answer is largely that the public is angry about the weak economy and is blaming major economic institutions such as business, government, and organized labor. As a result, support for unions should improve when the economy gets back on track. Moreover, despite the drop in overall approval the public continues to value many of the functions unions perform—such as helping workers. Still, labor unions may have suffered a more lasting blow. It’s hard to know the longer-term effect of the government’s bailout of GM and Chrysler, but the bailout was deeply unpopular and may have sullied unions’ reputations. Likewise, the conservative campaign to criticize unionized public sector workers’ compensation and work ethic—although very unlikely a major source of the decline—may have some effect on the public’s opinion of unions in the future, though data limitations make it hard to know this for certain. In short, public support for labor unions should recover when the economy improves. But unions may need to take some different actions and work on their public image to bring their approval ratings back up to pre-recession levels. This brief will examine these issues in more detail by surveying opinion polls on unions taken over the last several decades. The Gallup survey research group found in August 2009 that public support for labor unions had dropped significantly since its previous August 2008 survey. For the first time since Gallup began collecting information on Americans’ support for labor unions less than half of Americans (48 percent) said they approved of unions. Forty-five percent said they disapproved of unions and another 7 percent had no opinion. A year earlier a strong majority (59 percent) said they approved of labor unions while 31 percent disapproved of unions and 10 percent had no opinion. Unions enjoyed approval ratings for decades that hovered around 60 percent. Previous low points occurred in 1979 and 1981—also years of significant economic hardship—when 55 percent of respondents reported they approved of labor unions. Quite recently, in 2003, approval was at 65 percent. 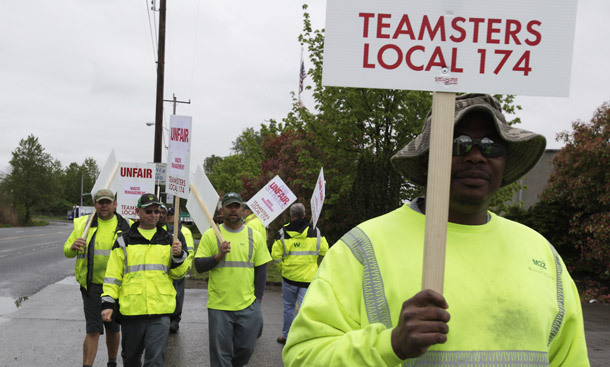 Polls taken after Gallup’s have confirmed a significant decline in support for unions. The Pew Center for the People and the Press found that the percentage of Americans who had a “mostly” or “very favorable” view of labor unions fell 17 points between January 2007 and February 2010, from 58 percent to 41 percent. Forty-two percent of respondents said they had “very” or “mostly unfavorable” view of unions and another 17 percent said they had never heard of unions or refused to answer. 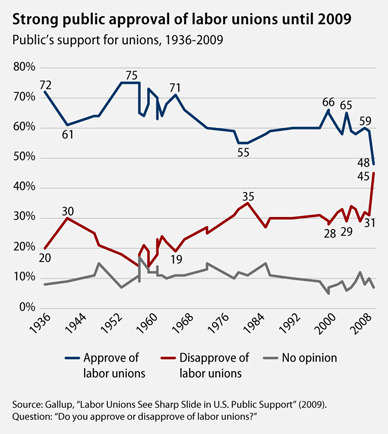 This is the lowest rating of public support for labor unions Pew has found since it began asking the question in 1985. Further, support for unions dropped sharply across virtually every demographic and partisan group, which indicates that the decline’s cause is likely something that has affected almost all Americans. Our analysis of the February 2010 Pew Survey showed that support for unions fell dramatically among Americans of all races, though respondents of color continued to have more favorable views of unions than whites. Support among blacks fell 11 points between 2007 and 2010, from 80 percent to 69 percent. Among Hispanics, it fell 22 points, from 82 percent to 60 percent. And support among whites fell by 15 points, from 60 percent to 45 percent. Favorability ratings of labor unions also fell among all age groups in Pew’s survey. But they fell slightly less so for young adults ages 18 to 29, who maintain the highest opinion of unions, and for 50- to 64-year-olds. Among the youngest generation, respondents with very or mostly favorable views of unions fell 11 points between 2007 and 2010, from 73 percent to 62 percent. Favorability ratings among those 50 to 64 remained the most stable, falling 5 points from 57 percent to 52 percent. Support among 30- to 49-year-olds and respondents 65 and over dropped dramatically. Favorability ratings among respondents 30 to 49 years old fell 19 points between 2007 and 2010, from 64 percent to 45 percent. Among the oldest generation favorability ratings were nearly cut in half—falling 32 points—from 68 percent to 36 percent. Unions’ favorability ratings fell 15 points between 2007 and 2010 for each educational cohort of Americans. They fell from 59 percent to 44 percent for those with a high school degree or less, 66 percent to 51 percent for respondents with some college, and 67 to 52 percent for respondents with a college degree or more. Support similarly fell across income levels. It dropped more than 20 points for those earning less than $30,000 per year, from 75 percent to 54 percent; 9 points for those earning between $30,000 and $75,000 per year, from 63 percent to 54 percent; and 17 points for those earning $75,000 or more per year, from 56 percent to 39 percent. It likewise dropped across the political spectrum among Republicans, Democrats, and independents. Among independents, favorable ratings dropped 17 points between 2007 and 2010, from 62 percent to 45 percent. Favorable ratings among Republicans fell by 18 points, from 51 percent to 33 percent, and among Democrats by more than 10 points, from 79 percent to 68 percent. It likewise dropped across the political spectrum among Republicans, Democrats, and independents. Among independents, favorable ratings dropped 17 points between 2007 and 2010, from 62 percent to 45 percent. Favorable ratings among Republicans fell by 18 points, from 51 percent to 33 percent, and among Democrats by more than 10 points, from 79 percent to 68 percent. 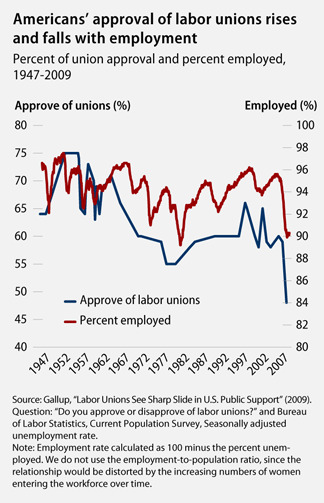 In sum, there’s clearly been a recent drop in support for unions among many Americans. Let’s take a closer look at what’s driving this decline. Americans are likely to blame the most powerful institutions in our society—government, big business, and labor unions—for economic downturns, as prominent political scientists Seymour Martin Lipset and William Schneider argued in their influential 1983 book, The Confidence Gap: Business, Labor, and Government in the Public Mind. Lipset and Schneider showed that while Americans see our country’s economic and political institutions as the glue that holds our capitalist systems together, they do not trust the leaders of government, large corporations, or labor unions to act in the public interest. Americans do not admire self-interested behavior, and they are suspicious of those who’ve acquired political or economic authority. In short, they’re skeptical of power. Labor unions may not have as much power as business or government, but Americans still view them as powerful, and increasingly so with the election of President Barack Obama. Sixty-six percent of Americans mostly or completely agreed with the statement “labor unions have too much power” in the April 2009 Pew Center for the People and the Press Values Survey—a 10 percentage-point increase since the question was last asked in 1999. Since Americans now see unions as having greater control over the government’s economic policies, unions also receive greater responsibility for the country’s poor economic performance in the public’s mind. Similarly, 44 percent of respondents to an August 2009 Gallup survey asking, “Would you, personally, like to see labor unions in the United States have more influence than they have today, the same amount as today, or less influence than they have today?” said that they would like to see labor unions have less influence than they currently do—a 10-point increase over responses just one year prior. Despite their skepticism of power, however, the American public realizes that the competing interests of government, labor, and business create a system of checks and balances between these actors that prevents too much power from being concentrated in these institutions. 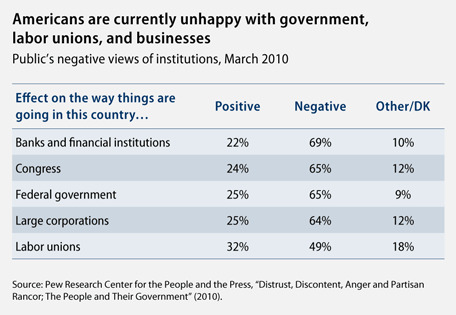 Consequently, Americans approve of conflict within and among their major institutions. The institutionalized tension between labor and business is seen as checking the power of both institutions. This support for our society’s major political and economic institutions but distrust of its leaders means that when things go wrong Americans are predisposed to turn against the institution’s leaders and assume that more honest and competent leaders could make fundamentally strong institutions work. Declining public trust in institutions is a reflection of the American public having unfulfilled needs and blaming these institutions for the unsatisfactory quality of life they are experiencing. Opinion polling appears to bear this out by showing that American’s support rises and falls for our society’s major economic institutions depending on the economic situation. Americans are currently very critical of the major political and economic institutions in our society as we would expect. A March 2010 Pew survey examining American’s rising dissatisfaction with the federal government finds “a perfect storm of conditions associated with distrust,” and provides a bleak picture of Americans’ views of government, labor unions, and business. Only a very small portion of respondents—between 22 percent to 32 percent—thought that these institutions had a positive effect on the way things are going in this country. It’s no coincidence that big business, labor unions, and government are all facing the public’s ire. Unions and big corporations may sometimes find themselves at odds over labor disputes and government policy, but public support for these institutions rises and falls together over time. The same holds true for government: Government is often the arbitrator of business and labor conflicts, but public support for government is also linked to support for unions and big business. 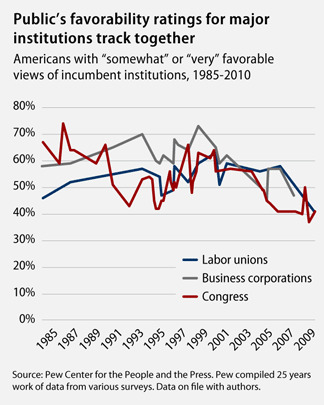 The figure at the right displays Pew survey data from 1985-2010 on the percentage of Americans stating they had a somewhat or very favorable view of labor unions, Congress, and business corporations. It demonstrates that favorability ratings for these incumbent authorities track together. While Congress’s favorability rating is more variable—in part, because we have more data—favorable views of big business and labor unions tracked very closely together for the last quarter century. 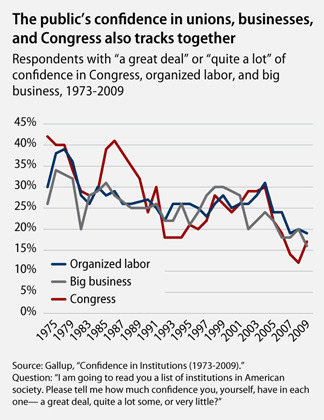 Asked another way, Americans’ confidence in Congress, organized labor, and big business also tracks together. Nineteen percent of respondents said that they had a great deal or quite a lot of confidence in organized labor in Gallup’s 2009 survey—down 12 points from 31 percent in 2004. Confidence in big business fell 8 points between 2004 and 2009, from 24 percent to 16 percent. And though confidence in Congress rebounded from a low of 12 percent in 2008, it was still 13 points lower in 2009 (17 percent) than it was in 2004 (30 percent). The fact that public approval of labor unions, big business, and government all fall during bad times suggests that Americans are most likely feeling cynical and expressing the conviction that the times are bad rather than rejecting labor unions, big business, or government. The charts below describe in more detail how much the state of the economy affects support for labor unions. As we would expect, over the past 60 years, when most Americans are able to find and retain jobs, approval of labor unions is high, but when the jobs are scarce, approval of unions fall. Regression analysis confirms this relationship, finding that for every point unemployment increases the approval rate for labor unions goes down 2.6 points. Previous studies have confirmed this negative relationship between unemployment and union approval rates. Lipset and Schneider looked at data from the 1960s through the early 1980s and found that every 1 percent increase in unemployment tends to lower confidence in leaders of organized labor 1.3 percent. The clear and direct impact that the economy has on support for labor unions suggests that when the economy recovers so too will unions’ approval ratings. This is further supported by evidence indicating that even in spite of the bad economy the public still believes that labor unions can play a positive role in the economy. Most Americans (61 percent), according to Pew, believe that “labor unions are necessary to protect the working person.” And a strong majority (70 percent) of Americans says that labor unions help unionized workers, according to Gallup. But despite the overwhelming evidence pointing to the economy as the main cause of the decline, other factors may be at work. 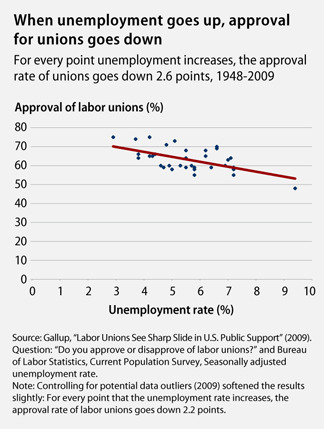 As a result, support for unions may not recover completely when the economy does. News coverage of the auto bailout and auto companies’ continued financial troubles captured the public’s attention from late 2008 until the middle of 2009. The public followed the December 2008 bailout closely and overwhelmingly disapproved of it. Moreover, the bailout put unions in a precarious position. The autoworkers’ union had to protect the welfare of its members by working with GM and Chrysler to secure the bailout money. In the public’s eyes unions were collaborating with these corporations instead of acting as a “check” on the power of big business. A significant minority of the public blamed unions for the industry’s problems, and viewed unions—a powerful player in securing the assistance—as helping its own workers over taxpayers. Americans opposed the bailout at the time of the rescue and continue to do so. Sixty percent of Americans said they disapproved of the “federal loans given to General Motors and Chrysler last year to help them avoid bankruptcy” in a March 2009 Gallup poll conducted three months after the bailout. And a May 2010 CBS News Poll found that Americans continued to oppose it over one year later: 65 percent of respondents said that the federal government should not have provided financial help to the U.S. automakers. A significant portion of Americans appear to blame unions for the financial problems at GM and Chrysler that precipitated the assistance. More than one third of Americans said that the unions deserve “a great deal of blame” when asked in December 2008 whether the labor unions that represent many U.S. auto workers deserved a “great deal of blame, some blame, not much blame, or no blame at all for all the problems faced by the three major U.S. auto companies.” This was second only to the 65 percent who placed a great deal of blame on the company’s corporate executives. Moreover, it appears that overall views of the auto industry are closely linked with attitudes toward labor unions—likely in part because of the bailout. Americans with unfavorable views of American automakers are significantly more likely to also have unfavorable views of labor unions. Sixty-six percent of respondents with very unfavorable views of U.S. automakers and 61 percent of respondents with mostly unfavorable views of U.S. automakers also had unfavorable views of unions, according to a February 2010 Pew survey. 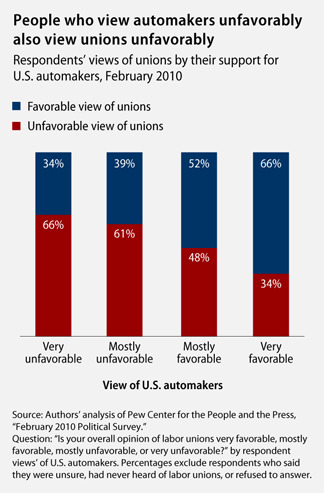 Only one-third of those with very favorable and less than half of those with mostly favorable views of American automakers have unfavorable views of labor unions. So the bailout has likely had some effect on the public’s view of unions, though at this point it is hard to tell what the lasting impact will be. The debate over whether and how much to blame government employees—many of whom are unionized—for the budget deficits that many governments now face also could potentially affect union support in the future, though there is little evidence that it has done so to date. Data limitations make it difficult to know for certain, but it is unlikely that concerns about public employee unions are a major reason for the recent drop in support for unions in general— most Americans support public sector unions despite the poor state of the economy. An April 2010 Rasmussen survey finds that 59 percent of adults favor unions for public employees, while 41 percent are opposed to them. Slightly more than half of Americans (51 percent) believe that public employee unions do not put a significant strain the U.S. budget, while 49 percent believe that unions do so. On a related note, Americans’ confidence in federal government workers—regardless of union status—is more positive than negative but still quite mixed. And these views largely held fairly steady between 2009 and 2010, with some minor declines in confidence according to a George Washington University survey. Americans expressing a great deal or a lot of confidence in “civilian employees of the federal government” fell 2 points, from 23 to 21 percent, and those expressing some confidence in federal workers also fell 2 points, from 55 to 53 points. Respondents expressing very little confidence in civilian federal workers increased 4 points, from 22 to 26 percent. Going forward, however, concerns about public sector unions could possibly prevent union approval ratings from returning to their prerecession levels. Many governments are now facing budget shortfalls that can only be dealt with by drastically cutting back critical services and potentially increasing taxes, and the debate over the causes of the budget deficits and what to do about them is a top tier issue that could move public opinion. The public’s favorable view of public employee unions could indeed change, especially since some conservatives are attempting to blame deficits on the compensation packages unionized public employees receive. Some evidence suggests opinions are already shifting for some populations. Public opinion is more negative in states where public employee unions are at the center of budget deficit debates. Recent polls indicate that a majority of respondents in these states believe public sector unions are a significant strain on the state budget. Sixty-eight percent of likely voters in California believe public employee unions place a significant strain on the state’s struggling budget, according to a March 2010 Rasmussen Reports survey. Just over half of voters in the state (55 percent) oppose unions for public employees, while 45 percent are in favor of them. And an April 2010 Rasmussen survey of voters in New Jersey found that after a fight between Governor Chris Christie and the teachers’ union over whether to freeze teacher pay, 65 percent thought public employee unions like the New Jersey Education Association put a significant strain on the state’s budget, while 35 percent disagree. Debates about public sector unions’ impacts on deficits in other states could potentially have similar effects. Steps organized labor should take to repair its public image are outside the scope of this brief, but Americans’ reaction to the auto bailout and deficit debate suggests that the public is willing to support unions as a voice for workers as long as unionized workers’ interests don’t compete with the public’s interests. In this case, Americans see unions supporting government assistance for automakers and generous compensation packages for their members as competing with their interest by giving special treatment to some workers and adding to government debt. This may suggest that unions should emphasize efforts that help workers get fair treatment—but not special treatment, publicize campaigns that check corporate power, and support initiatives that are seen as promoting the public interest. The sudden decline in Americans’ support for labor unions may appear to be a body blow to the labor movement. But labor unions’ declining approval ratings have little to do with Americans’ support for the protections that unions afford and, for the most part, should prove temporary. The public is angry about the weak economy and is blaming major economic institutions such as business, government, and organized labor. Also, despite the drop in overall approval the public continues to value many of the functions that unions perform—such as helping workers. As a result, support for unions should improve when the economy gets back on track. Still, the possibility that labor unions’ public image has suffered lasting damage can’t be completely ruled out. The highly unpopular auto bailout and government budget deficits may have longer lasting effects. Unions may need to work on their public image in order for approval ratings to return to pre-recession levels. David Madland is the Director of the American Worker Project at the Center for American Progress Action Fund and Karla Walter is a Senior Policy Analyst with the project.